For best results please follow our guidelines. If you wish to design your own project and have selected us to print it, thank you for the opportunity to be part of your business and allow us to provide a superior product to represent you to your clients. We would encourage you to speak to your account manager to obtain the exact specifications for your graphic design and our printing requirements. This would include file formats, resolution, bleeds, safe zones, and crop marks. By this method we can make sure we meet your project deadlines. We accept the following file formats TIFF, BMP, JPG(Hi-Res), EPS, PNG, AI, PSD, and PDF. 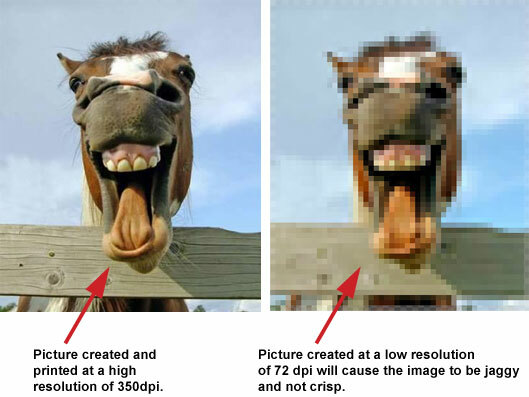 All file formats must have a minimum of 350 dpi (dot per inch) resolution. The images designed for the web are done at a low screen resolution of 72 dpi. Print images need to be created at 350 dpi or there will be a substantial drop in the image quality. This print resolution is recommended for handout material like business cards, brochures, rack cards, post cards, etc. If designing for outdoor signs or banners, a resolution of 720dpi and (1) one inch equals to (1) foot is preferred for best print quality. Example: 720dpi 4"x8" will make a banner of 48"x96". c. Some fonts have copyright restrictions and will not embed in PDF and will not print properly unless purchased.